MVA series conveyors are available in a wide variety of sizes and controller options such as timer and counter control, to meet various customers’ needs. The precisely extruded aluminum frames with slits (grooves) are easy-to-mount and provide simple yet stylish appearance. Its structure reduces distortion on the frame for long term use. The new type is now available to reduce the belt meanderings! A wide range of belts are available for various applications. 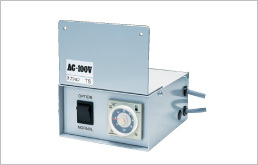 The angle is easily-adjustable within the avaialble range on the adjuster. Two stand types available; M stand with 810 to 1320 mm adjustable range and L stand with 1110 to 1920 mm range. Optional slide legs are available for your needs. Pick the most suitable gearheads for your belt speed. Speed adjustable type for continuous running. 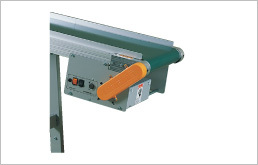 The conveyor receives the external signal and runs for the set duration of time. 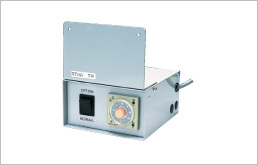 The conveyor runs and stops accoding to the settings of the ON-OFF timers. The conveyor runs for the set duration of time after counting up to the setting for the IMM or the robot signals. 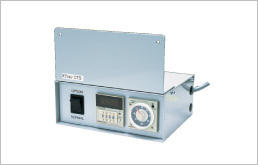 The conveyor starts running by the electric analog timer and stops by the electric digital timer. The conveyor starts running in the reverse direction after received the reject signal from the IMM or the robot. The conveyor stops when the equipped sensor detects the edge of the box. when the equipped sensor detects the edge of the box. sensor detects the edge of the box.